A tent wedding is a great choice because it allows for great freedom in design, and decor. 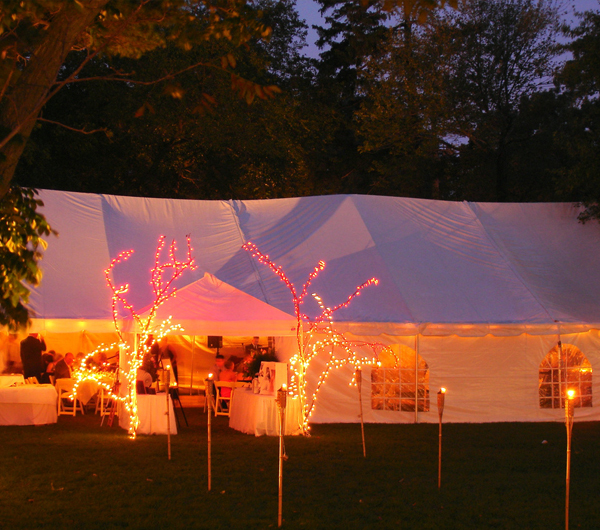 Lighting will play an even larger role with a tent wedding compared to standard hall type receptions. 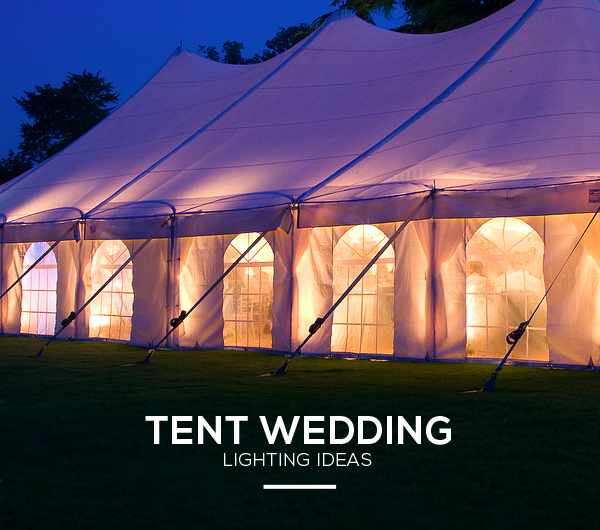 A tent is a blank canvas for wedding tent lighting – you have fabric everywhere, left, right, and up top. You can have tent lining that finishes off a tent making it ever so elegant with its sweeping, flowing and curving form tapering up to the ceiling. It is through lighting, where you decorate these bare walls of fabric. It is through lighting, where you bring the setting to life – and create a backdrop for your wedding just how you want it. There are a number of areas within a reception where you will need wedding lights – such as the dance floor, table lights, and displays (wedding cakes/flowers). We have an article that goes over the 7 basic areas that need to be lit: 7 Areas: Creating a Poetic Backdrop Using Wedding Lights. But there are some areas and light fixtures that are unique to tent wedding receptions, and that is what we will go over below. When it comes to planning the lighting for a tent wedding, you will need to know about the structure of the tent you will be hiring. There are a number of types of tents, such as ones that have no interior poles, or ones that have many interior poles. Some tents will be able to suspend lights from the ceiling, while others won’t. What will the layout be, and will you have a lining that finishes the tent’s interior? All these factors play a role in planning wedding tent lighting. Lights can be hung and suspended from the ceiling, they can be attached to the poles of the tent, or they can be freestanding. This all depends on the tent structure. 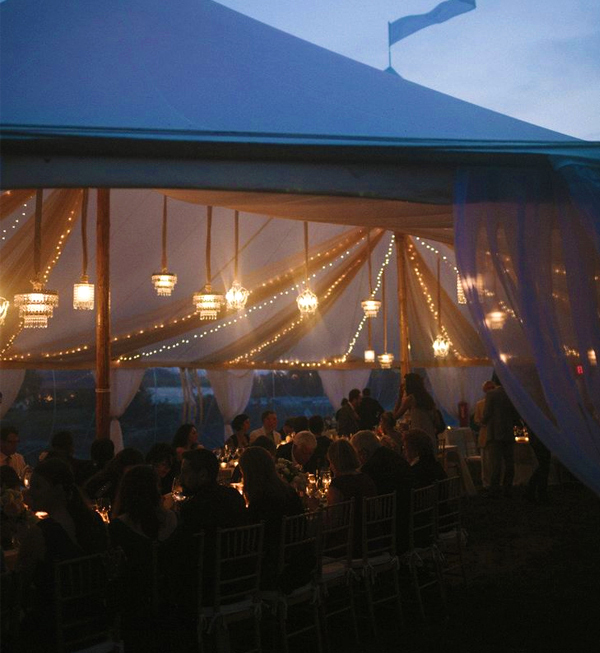 Your tent supplier will be able to tell you how lighting can be integrated with their tents. 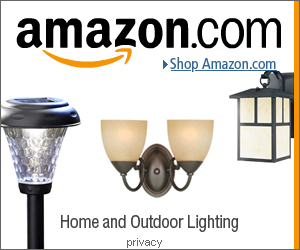 Most tent companies will have their own light fixtures that can be used. It is also best to look at lighting companies as they will have a wider range of lights that can be used to create a custom wedding feel and tone that you want. The most unique thing about a tent wedding is the feeling guests get when they walk inside. It is a contained space, isolated, and intimate. The ceiling will play an important role in creating the feel and tone of the setting. You can create a grand ceiling with draped linings. For lights focused on the ceiling there are a number of lighting ideas to use. Fairy Light Canopy: Use a large number of string lights, attached at the edge of the ceiling that then curves upwards into the center of the ceiling. This enhances the curves and flow of the ceiling – and creates a fanciful starry lighting effect. Paper Lanterns: Because these are light weight light fixtures, they can be easily suspended from the ceiling of the tent. They come in a number of colors to suite the style of wedding you are trying to create: (white, orange, purple, etc.) 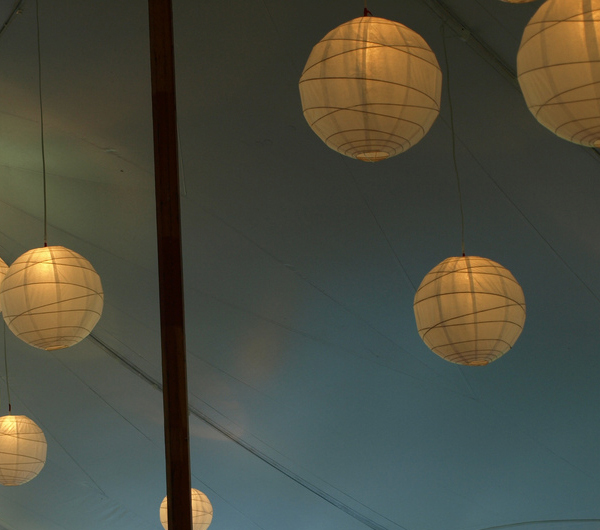 Larger than average paper lanterns work best to fill up a large tent space. Chandeliers are also an option. Some tent companies will have chandeliers on hand or party/lighting companies also rent them out. Chandeliers create focal points, so hang them above the dance floor, an entrance, or over the head table. Gobos: Gobo lighting is when you put a stencil (aka gobo) over a light fixture. What you get are surfaces lit with shapes and designs. These can also be used on walls and on the dance floor. 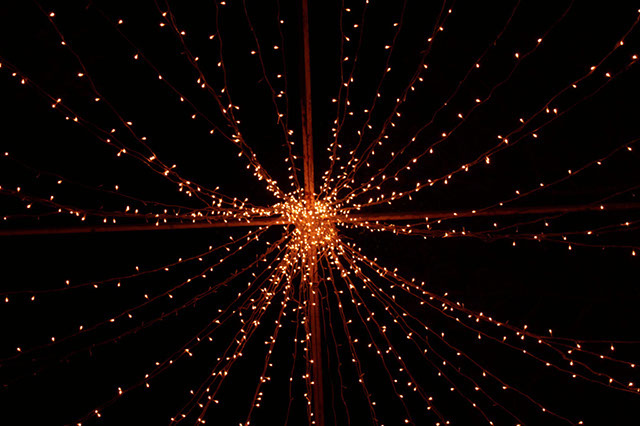 So stars, hearts or abstract designs can be projected onto the ceiling – adding to the wedding tent decorations. Up Lights are generally used to light up walls and poles. They also bounce light onto the ceiling. Don’t forget you can use colored gels, to change the color of the standard light fixtures – making them suit your wedding style. Hanging lights from the ceiling or attaching them to the tent poles might not be an option. Instead you can use free standing poles, and hang lights on them. These can be placed anywhere. The tent poles or the free standing poles can be decorated so they integrate with the whole design scheme – decorate them with flowers, fabric, tree branches, or wrap string lights around them. You can get more decorative and creative by using lighting props. For example Victorian street lanterns can be found at lighting/prop shops. Other types of light props, suiting different tent wedding ideas, include Japanese pagoda lanterns, snow lighting effects, or Moroccan lanterns – it all depends on the style of wedding you are going for. Monogram Lighting: Monogram lighting for weddings is the same concept as gobo lighting, but instead of shapes or designs you have the names of the bride and groom projected with light. Ideal for lighting the entrance or on the dance floor. Fairy Light Curtain: For this idea, you hang string lights side by side, creating a curtain of lighting. This makes for good backdrops – ideal for behind head tables or the stage. Table Lighting: Since there won’t be much overhead lighting – adding table lights is essential. One way of doing is to use pin lighting. This is done by using mini spot lights (can lighting), hung from the ceiling or on the poles. Have one light pointed to each table. Another way of adding table lighting is to plan for your centerpieces to include a lighting aspect. Whether this is in the form of battery powered LED lighting (DIY wedding lighting),or wedding candle centerpieces. Bring The Outdoors In: With a tent you have the option of leaving one or all sides open. This is great if you have a lovely landscape that you can show off. You will want to add lighting then to any outdoor features such as statues or any water areas. Don’t forget that outside of the tent needs lighting as well: this includes the tent itself and any paths or features you want to highlight. Have a look at our guide on outdoor wedding lighting ideas for such ideas as tiki torches, solar floating lights, etc. Inside the tent, if possible, you will want to have the lights change color every three hours or so. This helps in keeping a lively atmosphere. Keep in mind that green or yellow colored lights are not ideal lighting options. You want to use sunset colors such as orange or go for purple wedding lighting. Find out in advance if you need a generator to handle power for the band, caterer, and lighting. For other information in helping you organize you special day, New York event designer Frank Alexander gives overall advice and highlights the challenges on organizing a tent wedding.